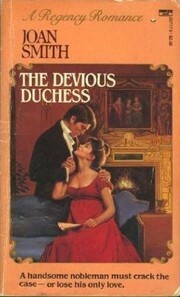 The Devious Duchess is the first of several Joan Smith novels that I’ve read that are “Regency-romantic-suspense” rather than traditional romance. It has the feel of a sequel: Lord Belami and Deirdre’s relationship is treated sparingly and some minor characters, such as Belami’s side-kick Pronto Pilgrim, are introduced as if we already know them. Indeed, when I did followup research, I discovered that The Devious Duchess picks up where Smith’s Midnight Masquerade ends. The downside of this mixed-genre is that the romance is not the focus of the story. However, the setup also means that the stakes are high: Belami already loves the heroine and is fighting for their future happiness. Although it was not what I was expecting, I found Smith’s historical-suspense concoction to be quite enjoyable. Perhaps it was enjoyable specifically because it is atypical. Since the hero and heroine’s relationship is not the primary focus, what matters in The Devious Duchess is how well Smith sets up the crime and its resolution. I am pleased to say that she does it skillfully. There are enough plausible murderers and accomplices to keep the reader guessing, and the mechanics of how the murder was accomplished are not obvious to the reader. I was kept guessing throughout, uncertain of where Smith was going. At the same time her clues were consistant and fortunately free of red herrings. There were only two details of the crime that I figured out well before Belami (and I have to admit, I was confused about why he–a detective–did not hit upon the answer to them sooner). However, my training is as a editor and dramaturg, so I tend to be hyper-sensitive to unravelling the mechanics of plot-construction. Other readers may not be distracted by the same issues. As a hero, Belami is enjoyable (though as I said, because this book is a sequel, the reader is assumed to know more about him than I actually did). He wrestles with a compelling moral question: What does he do if he must prove the Duchess innocent to save his relationship, but every clue he uncovers makes her look even more guilty? He must solve the crime, but what if the solution is not what anyone wants to see, least of all his fiancée? What if his work to win Deirdre back drives her farther away? A number of secondary characters are compelling: the miserly Duchess, who is deliciously mean yet sympathetic; the possible rival heir to Dudley’s fortune, the sneaky young Sir Nevil Ryder; and Dudley’s wildly inappropriate and crude estranged wife, an actress named Adelaide. Less compelling is how other characters–presumably more important in Midnight Masquerade–are “put on a bus” early in the novel, likely because Smith didn’t know what to do with them. Because The Devious Duchess is a mystery, I really cannot delve into its contents without ruining the book. However, I will say that for what it is, a historical-suspense novel set in the world of Regency romance, Smith’s book is successful and enjoyable. I recommend it to any reader who is looking for a variation on the Regency theme.